Hot chocolate is great and all (especially when made at home with real dark chocolate bars and whole milk), but sometimes even old holiday classics need a taste upgrade from time to time. For an enhanced hot chocolate experience, add a spoonful of Nutella to your mug, or a tablespoon of peanut butter. If you're feeling adventurous, replace the milk you use to make the hot chocolate with coconut milk, or make it spicy by adding cayenne pepper, hot sauce, or slices of habanero pepper. 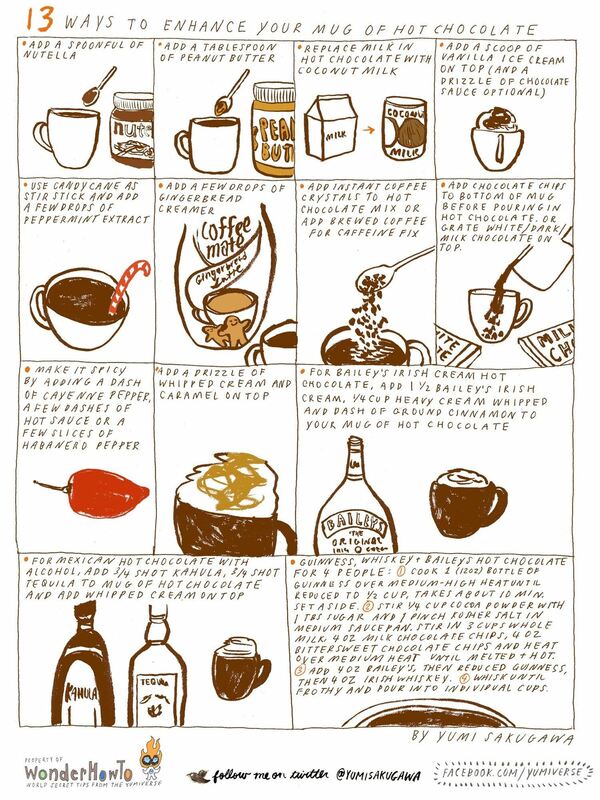 And of course, you can't really go wrong with adding alcohol to your mug of hot chocolate. Get through the rest of the winter season with a hot mug of Guinness, whiskey, and Bailey's hot chocolate.